Wendys Fondue Fries are a new item at Wendy’s. Have you tried Wendy’s Fondue Fries? 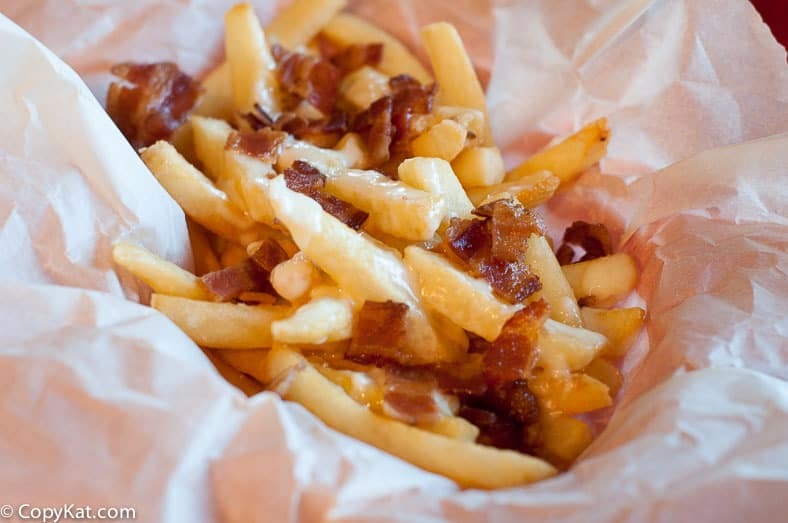 French Fries are topped with a cheese fondue sauce made of Gruyere cheese, and applewood smoked bacon. There are few things in life that are simply irresistible, freshly made French Fries, for me, is a treat that is hard to resist. French fries as Wendy’s are the natural cut fries. So there are bits of skin still left on the French Fries. In this recipe, these fries are topped with a creamy cheese sauce made with Swiss Gruyere cheese. 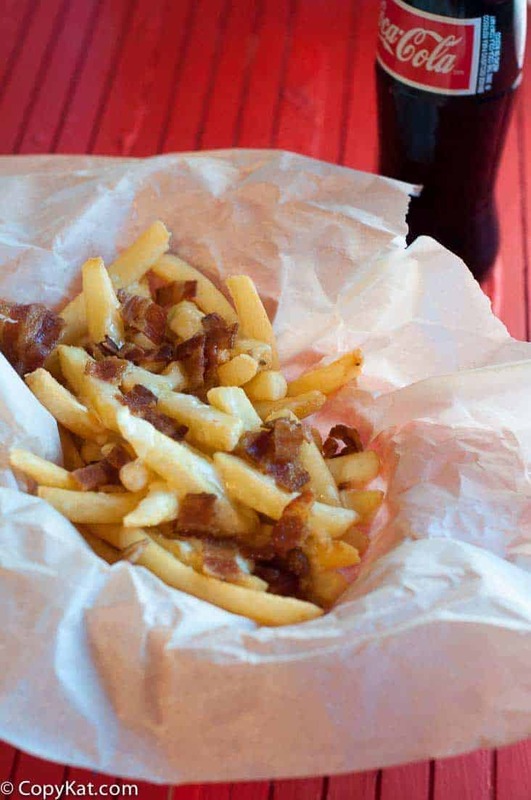 Then if cheese laden fries aren’t enough, the fries are topped with crispy applewood smoked bacon. You can recreate these at home. This will be a limited time only menu item, so you will want to enjoy these again, now you can since I have unlocked this top secret recipe for these French fries. What you will need to recreate this recipe, are some frozen French fries. Oreida brand makes some great French Fries. Most fast food restaurants use frozen French Fries; the freezing process helps the fries become extra crispy. Why are frozen fries extra crispy? Some of the water is lost from the potato during the freezing process. The frozen French fries are also partially cooked, giving you the crispiest fry ever. You will need oil for the fryer; I like to use vegetable oil. I just make sure the oil is heated to 350 degrees. You could use peanut oil, corn oil, canola oil, or even vegetable shortening. I don’t recommend olive oil, it is much more expensive, and I do not personally like the flavor of olive oil. For the bacon, the applewood smoked bacon, go to your grocery store, and pick out your favorite applewood smoked bacon. Oscar Meyer makes a great hardwood smoked bacon if you can’t find the applewood smoked bacon. I like to cook bacon in the oven. When you cook bacon in the oven, you get wonderfully cooked bacon that is crispy, flat and is made with no splatter. Cheesy goodness never goes out of style, enjoy these French Fries today. Do you like Wendy’s? Check out these Wendy’s Copycat Recipes. In a small saucepan over medium heat melt 1 tablespoon butter, when the butter is melted add flour. Stir in flour and cook for approximately 1 minute or until the flour begins to become fragrant like cooked pie crust. Add in salt. Add half of the milk in and stir until the mixture thickens, then add in remaining milk. Stir until the sauce is thick, add shredded cheese, stir until all of the cheese melts. You can thin down the sauce with additional milk if desired. Preheat the oil to 350 degrees. Fry the French fries until they are golden brown. Remove from oil, and drain over a wire rack. To prepare the fondue fries, place French fries on a plate, add fondue cheese sauce, and top with cooked bacon. My family gobbled these up in no time at all. did i miss the re ipe for the swiss cheese fondue sauce that goes on top? WE HAD DINNER AT RED LOBSTER LAST NIGHT. THEY SERVED A HOT DIP WITH LOBSTER, ARTICHOKE AND CHEESE. IT WAS OUTSTANDING. CAN YOU SHARE THE RECIPE? THANKS. I will have to check it out. Thank you! From the Kitchn.com “There are a few reasons why your stock may have turned out cloudy. Generally speaking, the cloudy nature of stock is simply due to impurities or particles in the stock. i wanna make french fries but i have no thermommether so i don’t know the temp of the oil my fries come tooo hard soft no taste & too greasy help me -lease ? i’m handicapped i don”t know or understand anything i need a lot of help me please ? If you have a wooden skewer, when you put the skewer in and it begins to bubble this happens at about 350 degrees. I don’t think your fries will become to soft, when frying, the sign that the food is done is that it floats upward, so that shouldn’t be an issue. To get it at the right temperature, make sure the oil still bubbles when you place the items into the oil. Let me know what else you need help with.